Composed of 108 articles arranged in 12 chapters, the Law on Forestry (the Law), which was passed in November last year, regulates the management, protection, development and exploitation of forests, along with the processing and trade of forest products. While the 2004 Law on Forest Protection and Development, which the Law will replace, focused only on forest formation, ranging from forest management to forest development, the new Law has a wider scope of regulation and numerous significant changes. Evolving from the 2004 Law which merely stipulated that forests belong to the people, the Law clearly specifies the forms of forest ownership. In the first form, forests, including: natural forests, planted forests wholly invested by the State, planted forests recovered by the State, donated to the State or with their ownership transferred to the State, are owned by the people but the State stands as their sole representative. In the second form, planted production forests, including: forests invested by organizations, households, individuals or population communities, and forests transferred, donated or inherited from other forest owners, are owned by these entities. The Law devotes a whole chapter (Chapter VII) to prescribing the forest product processing and trade, which are considered one of the strengths in the value chain of forestry products, creating favorable conditions for forest product processing and trade. To affirm that forest product processing is not on the list of conditional business lines, the Law lays down a policy on provision of support for enterprises to form joint ventures or partnerships with forest owners in order to establish raw material zones, manage forests sustainably, sell products, and apply high, advanced and new technologies to promote green growth and increase added value of forest economy. It prioritizes the development of allied industries required for forest product processing. Support will also be provided for the training of human resources for forest product processing. The State will develop and operate a timber legality assurance system of Vietnam and issue regulations on criteria and competence, processes and procedures for classifying enterprises engaged in timber and timber product harvest, transportation, sale, processing and export. The Law introduces policies on development of markets for forest products, facilitating the extension of preferential credit facilities to organizations and individuals that join in cooperatives or partnerships to purchase and sell forest products. The State will support the forest product branding, trade promotion, market development and provision of information about domestic and international markets for forest products. The Law clearly provides the rights and obligations of foreign-invested enterprises that are leased land by the State to plant production forests in Article 89. In addition to the rights of forest owners specified in Article 73, they may own trees, animals and other assets on leased land areas in which they have invested. They may also harvest forest products in planted production forests. To fulfill their financial and other obligations. Policies on international cooperation in forestry are specified in Article 99. Accordingly, Vietnamese State encourages the expansion of cooperation in forestry with foreign countries, organizations and individuals to support the achievement of the sustainable development goals, realization of commitments on environmental protection and response to climate change and other international commitments of Vietnam. The State encourages Vietnamese organizations and individuals to cooperate with foreign organizations and individuals in forest protection and development, forest product processing and trade, building of capacity and improvement of effectiveness of the state management of forestry in accordance with Vietnamese and international laws. 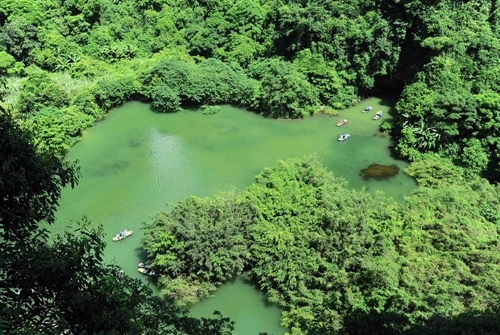 Favorable conditions will be created for foreign entities and overseas Vietnamese to invest in the training of human resources, scientific research and technology transfer for forest protection and development, nature conservation and forest product processing and trade in Vietnam. Resources for international cooperation in forestry and response to climate change will be developed and rationally and efficiently utilized. The State encourages cooperation with neighbor countries in prevention and fighting of forest fire, transboundary haze pollution, prevention and combat of illegal trading in timber and specimens of wild plant and animal species. The State will enter into international cooperation in forestry with foreign countries and international organizations on the basis of equality, mutual benefit, and respect for independence, sovereignty and law of each party and international law. The Ministry of Agriculture and Rural Development will propose the conclusion of treaties and international agreements on forestry, and act as the focal point and representative of Vietnam in exercising the rights and performing the obligations of a member of the Convention on International Trade in Endangered Species of Wild Fauna and Flora, the United Nations Convention to Combat Desertification and other relevant treaties.